New collection! The Fancy Picknick Dress Indigo from Steady Clothing. This darling dress is the perfect cute & sassy dress! 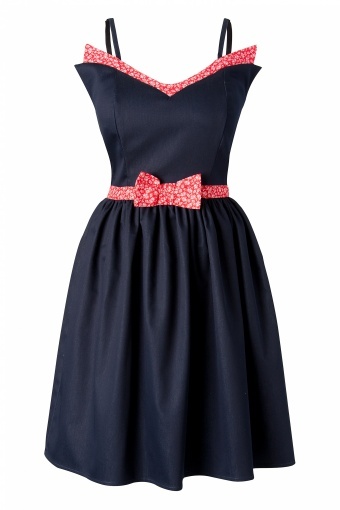 Made from a lightweight deep indigo blue cotton denim with a slight stretch to it and with fun red trim (the fabric on our dress somewhat differs from the fabric on the pics: as shown on the product picture). The dress has a fitted bodice with sweetheart neckline and thin spaghetti straps. The skirt has a gathered waistline and is accented by a red floral bow. Backside zipper.